If like me, you’ve been lucky enough to experience Thailand first hand, you’ll be only too familiar with the idyllic vision that comes to mind; crystal clear waters that glisten in the sunlight setting the backdrop to white sandy beaches surrounded by vibrant tropical plants and flowers. From the heart of the rainforests to the beautiful islands, Thailand really is a place that will remain a picture of paradise in your mind that you’ll want to revisit again and again. Having spent a month travelling around the country myself, I wholeheartedly admit I’m a bit of a Thai-junkie. I love the food, the culture and of course the divine (if not sometimes slightly painful), traditional Thai massages. So if you’re looking for a treatment inspired by the traditions of Thailand, Thai Square Spa is the ideal spot to relax and unwind after a hard day at the office, or a serious day of shopping. Located in the heart of trendy Covent Garden, Thai Square Spa is a tranquil retreat tucked away from the chaos of the square’s famous street performers and bustling shops. As I walk into the building I’m instantly transported into an oasis of calm, greeted by relaxing, soothing music and lavish décor. Towering, carved Buddhas lead the way through softly lit walkways of exposed brickwork, hanging copper lanterns and exotic lotus flowers. 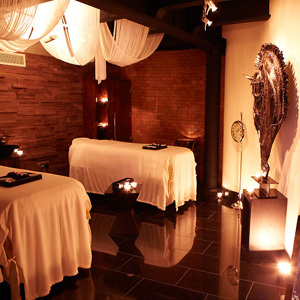 There are seven treatment rooms, all offering a range of decadent massages, facials, beauty treatments and traditional ritual therapies that work to cleanse and restore the body’s natural balance. I opt for the Body Bliss Ritual massage that gently works to calm the nerves and relax the muscles using aromatic, sensual oils. A sublime massage focusing on relaxtion, but vigorous enough to gently work out any uncomfortable knots. An hour’s treatment left me supremely relaxed and my mind in a state of calm, with stress merely a distant memory. After my massage I’m taken to the relaxation area where I’m given a refreshing jasmine tea to slowly savour whilst I prepare myself to step back into normality. With friendly staff, wonderful soothing treatments and a luxurious setting, this spa really is a treat that you won’t want to miss out on.